Bannari Amman Sugar Ltd is in portfolio of Anuj Anantrai Sheth. He is one of the top investors in India. The company belongs to Sugar sector. Unit 1 – Erode District (Tamilnadu) capacity of 300 MT of refined Sugar per day and 4,000 Tonnes of Crane Crush. Unit 2 – Mysore District (Karnataka) capacity of 500 MT of refined Sugar per day and 7,500 Tonnes of Crane Crush. Unit 4 – Tiruvannamalai District (Tamilnadu) capacity of 500 MT of refined Sugar per day and 5,000 Tonnes of Crane Crush and 29 MW of Power Co generation plant. Unit 5 – Villuppuram District (Tamilnadu) capacity of 3,600 Tonnes of Crane Crush and 25 MW of Power Co generation plant. The stock had its dream run between 2002 and 2007. In year 2002 it was trading at 175 levels and in next 5 years it gave around 10 times return to investors. This was best period for the Company. After that it had cyclic movement with 1,000 being the center of movement. The stock kept moving upwards and downwards for next seven year period and finally making decisive positive movement in year 2016. Note Sugar is cyclic sector so this type of movement can be seen in all Sugar stocks. 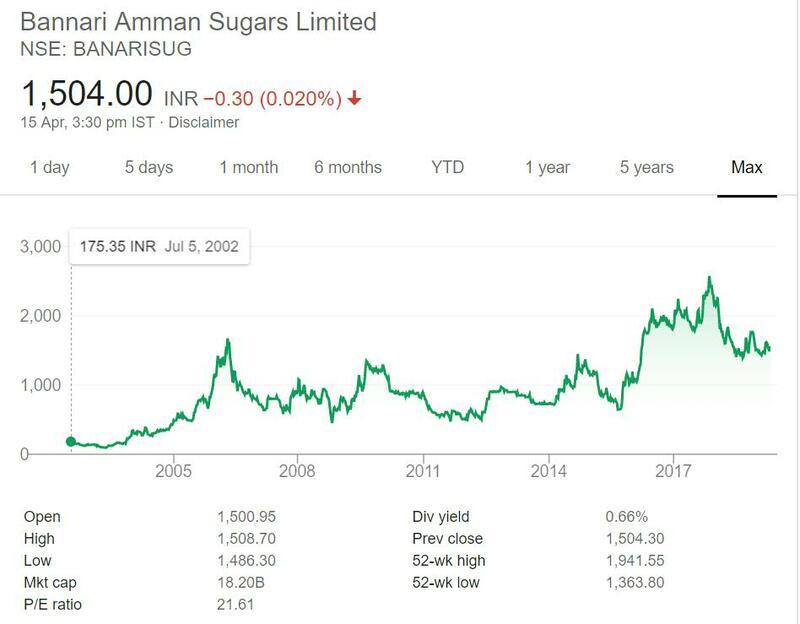 Bannari Amman Sugar Ltd is a Sugar Company.Sugar as a sector is cyclic in nature. There is no doubt on it being cyclic. But this is also a sector which is here to stay. You can be sure that down the line after ten years or so Sugar will be present. So it is kind of evergreen sector. Sugar stocks give decent returns only if you have entered at right price. You may have to wait for few years after investing. These stocks give swift movement as well. So you get the returns you need from them. But most of the times investors miss the right entry price as well as exit price. Cyclic stocks are good money makers if you can decide entry and exit points. If you have trouble with it then you should not burn fingers in cyclic stock. Note perfect entry and exit does not exist but you need to catch part of it. As of this writing I do not own any Sugar stock in my portfolio. I rarely invest in Cyclic stocks. Though there are one or two cyclic stocks in my portfolio but most of the time I prefer incremental revenue generators.